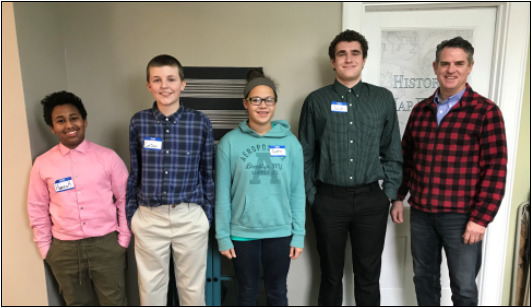 Thanks to Linda Murray for sharing her expertise in the home mortgage business and to Dipietro’s for the awesome pizza and sandwiches we enjoyed for lunch! Can’t wait to see what this crew does in the future!! Mary and John listed their home on Mussey Street with us a few months ago and their home sale was NOT a smooth process! Two separate sets of buyers backed out of contracts to purchase the house for different reasons. Sometimes that’s just the way things go! We were able to secure a 3rd buyer who stuck it out with us but she required that the lawn to be mowed and a pile of large logs and wood in the back yard be removed prior to closing. Mary and John had moved out already, so Jackson and I loaded up our lawnmower and chainsaw and headed over on a 92 degree day! We mowed the lawn, cut up the wood and loaded it in the back of my truck to be hauled away. I don’t know many real estate agents that will show up with a truck, lawn mower and chainsaw to help their clients! We are here to help with more than selling real estate. We do whatever is takes to get the job done! We recently listed a seller’s home and quickly secured a contract for $22,000 over her asking price. 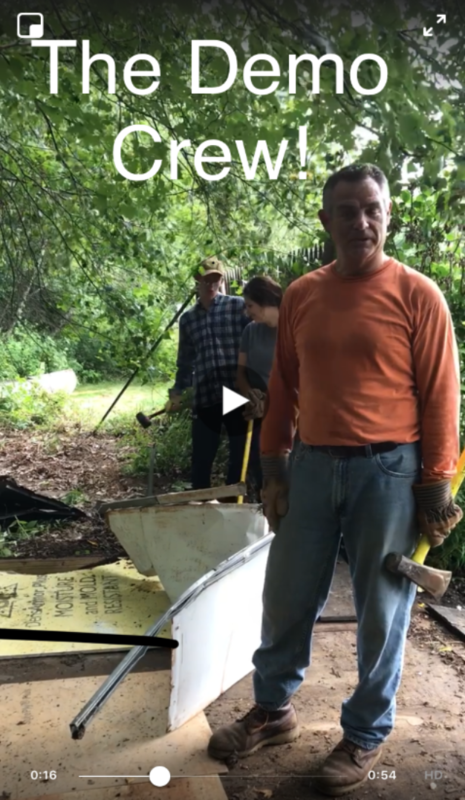 When the buyer later requested $1,000 to demolish a 30 year old shed that was sitting outside her boundary line, we just couldn’t let her pay that! We showed up with our own crew, demolished the structure and hauled it to the dump ourselves —saving her even more money $$! Check out Brian’s Facebook video on this and follow our page for updates on much more! As France continues to celebrate winning the World Cup in soccer, our son Jackson and thousands of other high school athletes have begun training for their upcoming fall sports seasons. Jackson and I have been up at Wainwright Fields every Sunday night this summer overseeing a weekly pick-up game and we’ve been joined by Gabby, some girls and boys from SPHS teams along with a few recent graduates and old Dads, too. Spending time at Wainwright has brought back many memories of Gabby and Jackson playing soccer in South Portland. Remember Soccer Magic? Our kids’ first exposure to organized soccer in So Portland. When Gabby was five and Jackson three, we’d go to Wainwright every Saturday and have a great morning doing soccer drills and playing. What a great program for our kids here. Then there was South Portland Rec Soccer. There were teams, goals and actual games! This was like the World Cup to us! I noticed a bunch of boys in Jackson’s age group that were very good, so I made some calls and started a team with the SP Strikers. What a great year we had. We brought together a bunch of rag tag kids and within a few weeks we had them playing really good soccer. It was so much fun to coach them and watch them grow as players and as a team. After a great first year, a phenomenal year followed. We had enough kids in Jackson’s age group to form 2 teams! With 20 players, our practices started being a lot more formal. We incorporated team rules which we would go over during our warm ups and when we stretched; (1) Say thank you to your Mom or Dad, (2) Be on Time, (3) Respect the officials and other players, (4) Do your homework and work hard during practice, (5) Have Fun. During Jackson’s 6 years as a Striker these rules followed our team. They were simple rules but very important to a team’s dynamic and in working with kids. My last year as a Striker coach the board of directors for the Strikers would not allow us to have the rules as it wasn’t a Striker policy. Even today I still scratch my head… we all need rules! So here is the real estate twist… we have the same rules in business! Every day I use the same rules! (1) We say thank you to our clients or to those that help us. We send out personally written thank you notes and actually mail them! (2) If I don’t show up on time, I don’t get the job. You have to be on time. (3) In working in real estate, you have to respect your other real estate agents and their clients. Even though they are trying get the best deal for “them” and you’re trying to get the best deal for your clients. You have to have respect and work together. (4) You have to do your homework. Study the market and know everything about the market and be ready for it to change. You have to work hard in business. If I wait by the phone hoping you will call, you won’t. I have to market our services, send out newsletters, do Facebook videos, calls to my past clients and sphere of influence, I have to keep working hard. (5) And let’s not forget you have to have fun. This business is very stressful but every day we have fun! If you don’t have fun in what you do, find a way to have fun. For us, this could even mean chicken-sitting when your clients go away! We love chickens here, and I know I’ll have fun feeding and talking with them! Say Thank You. Be on Time. Respect people. Do your homework and work hard. Have fun. I love rules! Are you wondering how the market’s trend is effecting the value of your home? Call us TODAY to find out! We’ll provide you with a full report for FREE! When I was a young boy, my school mates and I couldn’t wait for the last school bell to ring and for summer to begin! Later we would get our report cards and learn whether we were invited on to the next grade—I snuck through every year! Little league was always in full swing by then and we would ride our bikes 3 miles to the field with gloves slid over our handle bars. Days were spent with my friend and his brothers, swimming at Seal Cove Pond, looking for frogs, and playing king of the raft. They were glorious carefree days of summer in small town, Maine. What a great time and area to grow up! I can smell the wet raft drying in the hot sun even now. In mid-June, “people from away” would arrive and we’d have lost tourists asking directions to get to Southwest Harbor or Bar Harbor. Sometimes my friends would give them the wrong directions (I never did that!). We’d see vehicles from all over the country– I couldn’t blame them for wanting to come to Maine for vacation. We’ve finally made it to our summer season, and it’s a hot seller’s market! Home values continue to climb to heights none of us could have imagined. Just yesterday I was mowing a lawn at Melissa’s latest renovation in South Portland. A couple neighbors stopped to talk about the house and asked what the listing price was going to be. When I told them, and they both started laughing in surprise! Hmmm, I thought. Funny response. But was it? What do you think the value of your home is? Do you know or are you guessing? Home sale prices here are unusual. Some homes are going anywhere from $5,000 to $80,000 above asking price! That’s right… $80,000 over asking price. There’s a home in So Portland I’ve been interested in for a few years now. The exterior needs a lot of work, the grass is often a foot or more long and the roof needed new shingles a few years ago. I’m not sure what the insides look like, but I imagine it needs some TLC! I always wanted to see what magic Melissa could work on that house— it could be gorgeous once again! Just found out last week the owner sold it for $200,000! I almost fell off my chair. A quick look at the MLS confirmed what I thought. That home was worth at least $240,000 in AS IS condition. With some heavy cosmetics, paint, new floors, new kitchen and bathroom that home would sell for $450,000! Oh My! The owners had left money on the table! So, what is driving up our prices? Is it our location? Maybe. Is it our great economy in Southern Maine? Maybe. Sixty buyers came to last Open House. A few times during the open, I went outside to confirm what I thought was happening. The cars lining up had license plates from all over! There were plates from Maine, Massachusetts, New York, Rhode Island and New Hampshire but mostly Massachusetts! Buyers relocating to our area are also having a BIG impact on our home values. Inventory is still very low, making it a great time to sell! I would like you to consider what the value of your home is but don’t take action until you talk with a South Portland real estate specialist! There is so much going on here and you need to consider everything when pricing your home. Give us a call today. With over 21 years of experience in our neighborhoods, we are the area experts! It IS all about the money! He has a family in need of more space.His kids have grown over the last 10 years and have lots of friends they hang out with and the family is ready to move on to a larger home they can create a whole bunch of new memories in. The more money they make on the sale of their current home, the easier that transition will be.They’ll be able to make a larger down payment, reduce their monthly expenses, or even afford more of a house than they thought.It IS all about the money! So, what’s driving our local home values up? Is it our wonderful mild winters? No! Is it the generously low taxes we Mainers pay? No! You’ll find the real answer by taking a look around our neighborhoods. Walk around Mill Creek. Grab a cup of coffee at a local shop. Bike the Green Belt from Wainwright to Bug Light. Indulge in some goodies from The Cookie Jar or Scratch Bakery and enjoy them on Willard Beach. Run to Fort Williams and back. Walk to one of our awesome restaurants and then take in a show at the theater. Check out the Memorial Day Parade, the Fourth of July Fire Works and Art in the Park. Bundle up and take a ride on the horse drawn carriages, sing Christmas carols and visit with Santa at the annual Tree Lighting event! Come by our office and give the Easter Bunny a hug! There are so many things that make our community special and they are a big part of what makes this a desirable place to live thus increasing demand and property values. But what are the other factors impacting our values? 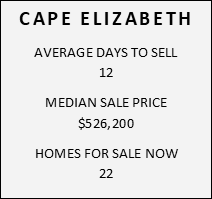 Home values are changing quickly.Demand is VERY strong and some of the stats are bit unbelievable. Take a look at these examples:51 Willow Street sold for $43,500 above asking price. 73 Summit Street sold for $55,000 above asking price. 10 Jessica Lane sold for $25,100 above asking price. 90 Chase Street sold for $55,000 above asking price, 307 Pine Street sold for $52,900 above asking price, 93 Davis Street sold for $32,108 above asking price, 58 Providence sold for $51,000 above asking price and 234 Harriet Street sold for $39,500 above asking price. There are many similar examples.What is driving these sale prices? If you have any insight email, text or call me. I think I know the answer. 21 years in this business has taught me to pay attention to who the buyers in our market are, their demographics and where they are coming from. What does all this mean? If you are thinking about selling your home, choose an area expert! 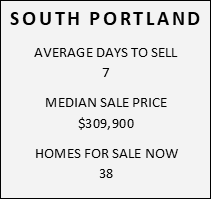 The neighborhoods of South Portland are unique!A part time or new agent that doesn’t sell a lot of homes in this area will not recognize all of the factors that are supporting our higher values. You want to get the most possible out of your home sale. Don’t let an inexperienced agent under price your home and risk leaving money on the table. It IS all about the money! Melissa and I had been in business about 5 years when we noticed a new trend in the way real estate agents were conducting their business. Many of the national trainers were supporting “MEGA TEAMS” as a more efficient way to do business and a better way to make money. We studied the systems they were using and looked at all the pluses and minuses to figure out what way we wanted to handle our business. Mega Teams operate with a group of agents that all specialize in one area of the business. The listing agent (the star agent) works to lists homes to sell and generates leads for their buyer’s agents to work with. The buyer’s agents call, and email prospective buyer leads that may be calling about a listing. They try to develop a relationship with that buyer in hopes of helping that buyer find a home. There is a transaction coordinator who processes a transaction from the point it goers under contract right up to the closing day communicating with the seller on all the details. They line up inspections, follow the buyers financial progress, schedule the appraisal and let the seller know how the buyer is doing in each step along the way.They also have an administrative position that does many things in the office from answering phones, taking leads and distributing them to the agents, keeping up on all the marketing materials the agents will use and many more assigned duties. Melissa and I had some serious discussions about becoming a Mega Team or staying a small 2 to 3-person team.The ultimate decision for me occurred over a period of a year.I had several listings that went under contract and during the inspection phase problems with the property were discovered.In one transaction a buyer couple asked for a new roof as the inspector said it was at the end of its useful life. The buyer’s quote was for $7,000 and my sellers thought the deal was going to fall through.I called my roofing contact and asked them to stop over and give an assessment on the roof. During his detailed inspection, he found the roof to be about 15 years old which meant it should last for another 5-8 years.We submitted his report to the new buyers and were able to move forward with the sale without having to install a new roof! Another listing had inspections that showed the furnace had a crack in the fire wall and the buyers asked for a whole new system.I once again call in an expert.Our heating contractor came over to inspect the fire wall and after a quick inspection reported that the fire wall was designed that way!Apparently, its part of the design for that model furnace and was pieced together so it “looked” like it was cracked but it was functioning the way it was supposed to.He provided us a letter as well and that sale also went through and without a new furnace. There were many more examples that year that reinforced my decision to stay a small team.I know without my direct involvement; those transactions would not have gone through or my sellers would have spent money on unnecessary repairs.I like to represent my clients the whole way through the process.If issues come up Melissa or I will be there to answer questions, give guidance and help find solutions.During a normal listing period I end up talking with our sellers 3-5 times a week, depending upon what is going on.During one of our last deals our seller called me just about every day!I had him on my speed dial and his smiling face would pop up every time he rang. And crazy as it sounds, I really liked talking to him!He had previously had his home listed on the market with a Mega Team and it did not sell.He is still on my speed dial and I still talk to him frequently– even after we sold his home! Melissa and I have intentionally stayed small because we still think it’s important to know the people we are representing, and we feel they deserve to talk with us directly. We are the agents they hired to represent them, and they shouldn’t have to go through a transaction coordinator or team members with less experience. We frequently see Mega Teams looking to hire or to replace someone from their team that has moved on. I just celebrated my 21st year in real estate in April and I’m not moving on anytime soon! Melissa and I would love the opportunity to represent you and maybe you will be the next client on my speed dial! Enjoy Spring! to find out. You may be in for a pleasant surprise! Homeowners often launch a round of home improvements in anticipation of putting their houses on the market. 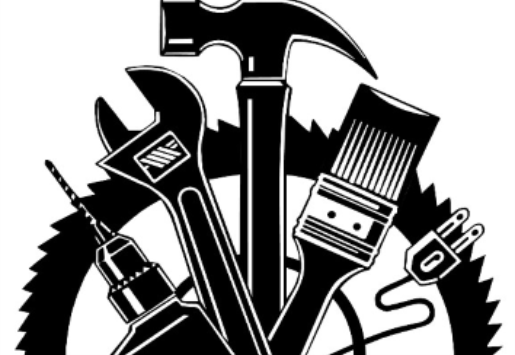 If you are getting ready to tackle a few home upgrades, you’ll want to make sure you get the most bang for your buck as you add to the overall appearance of your home. Updated lighting fixtures, fresh paint and new flooring are among the most common face-lifts. But before you decide to purchase equipment or materials, be sure you know what you may already have. You may have hardwood floors underneath a worn and outdated carpet. Refurbishing the original hardwood floors could add real value to your home. Those heavy draperies may have been custom-made, but there’s no reason to keep them if they don’t appeal to the tastes of current home buyers. Consider taking down heavy or dated draperies to let in more light. Simple sheers tend to give prospective buyers the impression of window treatments without taking away from the home’s intrinsic beauty. When you prepare your home for sale, try to disregard your own tastes and style and look at the home as objectively as possible. Doing so may reveal valuable opportunities you never anticipated. Trying to determine which projects to take on? Call us for a FREE consultation. We’ll help you put a plan together and even help with contractor referrals. 207-767-3366.